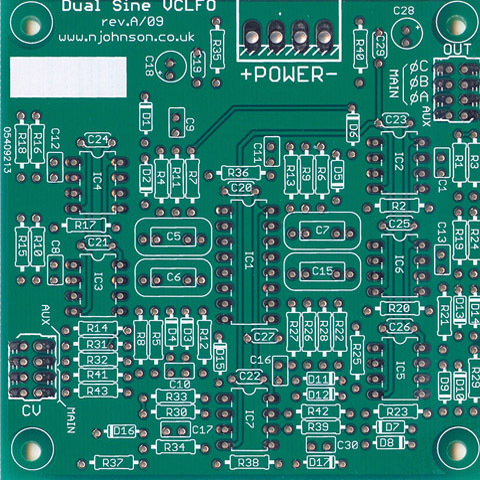 I built the voltage controlled low frequency oscillator PCB from Neil Johnson which uses the Analog Devices SSM2164 quad VCA. Rate control for each LFO. I set the upper limit to 7.5 volts which produces an upper frequency of ~60 Hz. I created three 1U concept designs for the module. The main LFO has both a rate and FM attenuator. 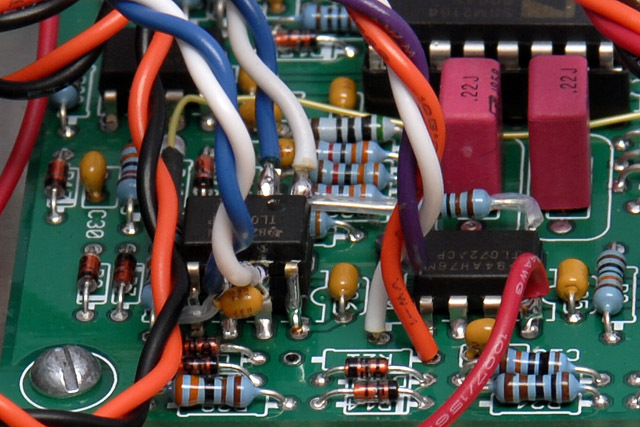 The Aux LFO has a FM input but no attenuator and both a triangle and sine output. I had to compress the jack spacing to fit 7 on a 1U panel. 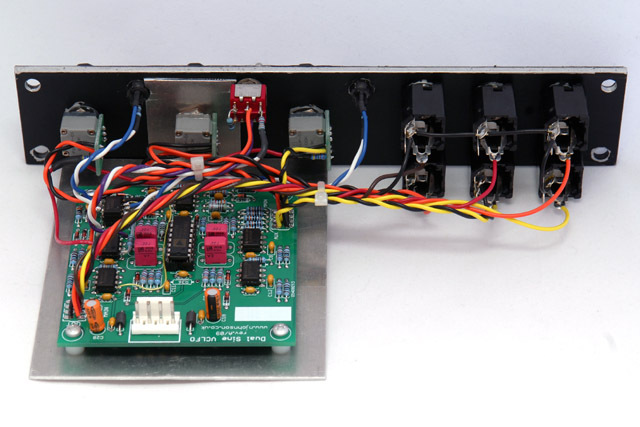 The center panel uses small potentiometers which allows both a Rate and FM control for each LFO. 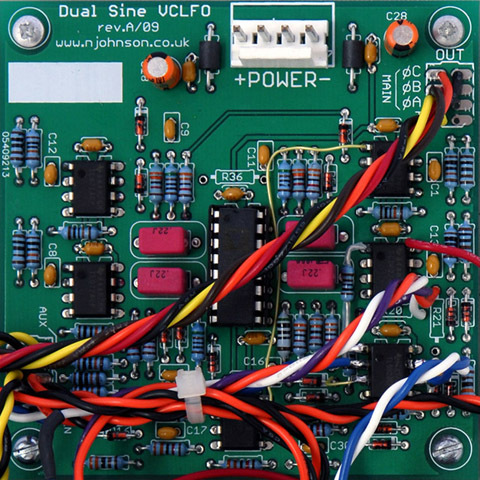 I eliminated the 7th jack by using a switch to select between a triangle and sine output. The right panel is standard MOTM spacing. The main LFO has both a rate and FM attenuator. The Aux LFO has a FM input but no attenuator and a switch to select between sine and triangle output. I chose this design and made a panel out of 1/8" aluminum with a paper overlay. I use spray adhesive to mount a full size laser print of the FrontPanelExpress file and then cover it with a couple of coats of lacquer for texture and sheen. This is my third module using this type of panel and they seem to hold up reasonably well. I made a PCB bracket out of aluminum and used P260P potentiometers from BI Technologies, and potentiometer chiclets from John Loffink. I added the additional LED op amp on top of IC5. 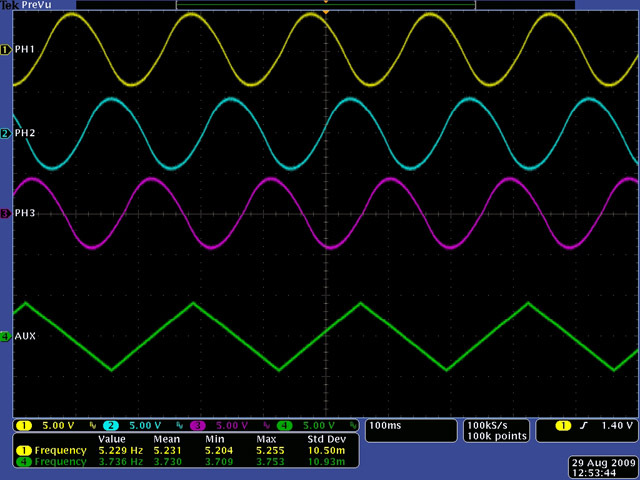 The LED for the main oscillator indicates the polarity of phase 1 (0º). These scope images show the three phase sine waves from the main LFO and the sine or triangle wave from the aux LFO. 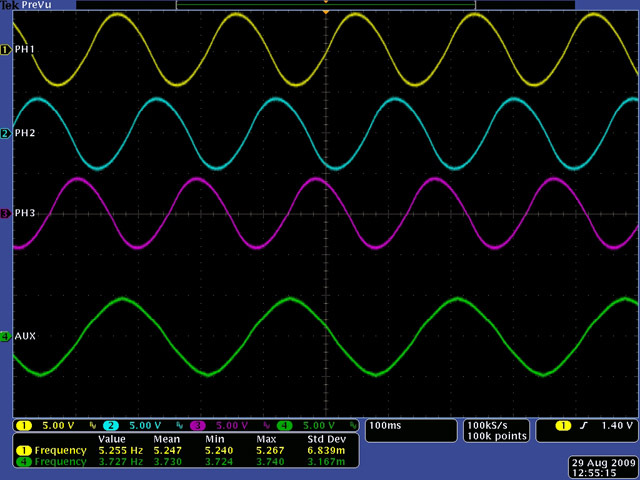 The diode waveshaping produces a reasonable sine wave.